Please enter your email and password below to log in to the EvolveHub. course content, complete online assessment and view course progress. If you access your study materials via the Student Portal, click the STUDENT PORTAL BUTTON below. Sciatica is a condition where pain is felt in the sciatic nerve. The sciatic nerve is the longest in the body, starting in the lower back and running down through the buttock, hamstring and into the lower leg. Sciatica originates from nerve roots in the spinal cord that pass out between the disc spaces from the spinal section L4, L5 and S1 and join up to form the sciatic nerve. Sciatica is pain experienced at any point in the sciatic nerve. It is most commonly experienced between the ages of 30-50, and in most cases resolves by itself within six weeks to three months. It is always good to remember that sciatica is caused by an underlying condition and hence is only the secondary body ailment/symptom. Sciatica causes a sensation of pain that usually begins in the lower back. The pain can be localised just to the lower back but will often spread into the back of the leg, calf and sometimes the foot. The quality and quantity of pain can vary depending on the person and the cause. Sciatica can also cause tingling, numbness or muscle weakness in the affected leg. Because sciatica is a secondary condition, the cause can vary. Understanding the cause is to determine what is compressing or aggravating the nerve, as this is what is causing the nerve sensation called sciatica. Herniated disc - Herniate means 'bulge' or 'stick out'. Intervertebral discs are the spongy discs that form a cushion between the vertebrae of the spine. The discs have a strong outer layer made of cartilage, with a soft, gelatinous center that acts as a shock absorber. If the outer layer of the disc becomes weak, through age or injury, the soft center can bulge out through the weakness — this is what is known as a herniated or ruptured disc. Bone spurs - Bony outgrowths on the edges of joints. Bone spurs form where cartilage is worn away (for example in arthritis) and bone is rubbing on bone. Bone spurs are not painful in themselves, but unfortunately, the bone spurs can rub on nearby bone or nerves, causing problems. Piriformis syndrome - An uncommon cause of sciatica. The piriformis is a muscle that lies deep underneath the gluteal muscles of the buttocks. Lumbar spinal canal stenosis - Stenosis means narrowing, and lumbar spinal canal stenosis is narrowing of the space available for nerves in the lumbar spine. Narrowing of the lumbar spinal canal puts pressure on the nerves. Other causes - Essentially, sciatica will occur when there is any form of impingement on the sciatic nerve. 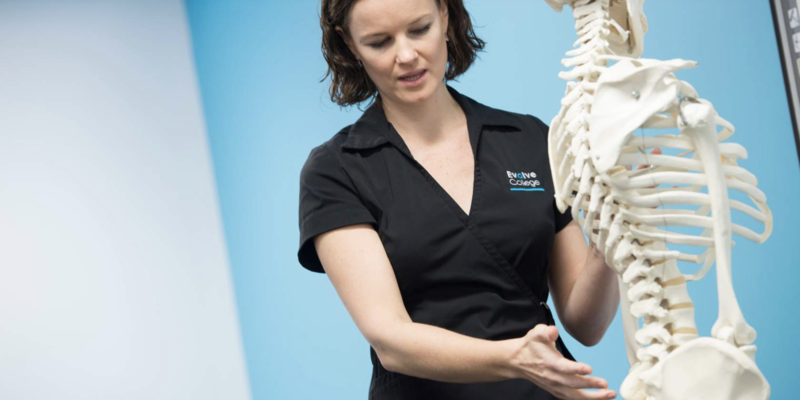 More causes include: tumours impinging on the spinal cord or the nerve roots, trauma to the spine, joint inflammation, locked facet joint, injury that irritates or pinches the nerve or spine degeneration sacroiliac dysfunction. Treatment options for sciatica will vary depending on the cause. Some cases will require surgery as others can be treated with massage therapy and self-care. 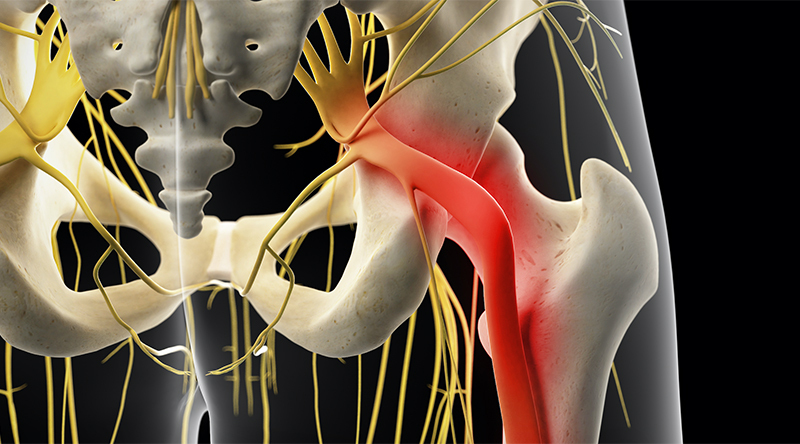 If the sciatica is severe it is best to see a medical professional for advice and diagnosis. In minor cases, people can seek treatment from a massage therapist or physiotherapist. If a massage therapist is to attempt to treat sciatica, they should make sure they have adequate understanding and training to treat the varying presentations. It is important the massage therapist understands the cause and the experience of the client to determine an appropriate treatment plan. Evolve College teaches the appropriate treatment of sciatica and specialised clinical skills in the current massage course. If you would like support treating this condition, please get in contact with our team as we would be more than happy to help. Receive all of the news delivered directly into your inbox.